Streaming services like Netflix and iflix are a great source of content but not necessarily new content. Early on you come to accept that for most shows you'll feel like you're a season behind cable TV or a few years behind for movies. But this doesn't mean you can't find great things to watch. So during my explorations of the local Netflix library I ended up finally watching Lost in Translation after years of it being on my radar. But for one reason or another I never got around to watching it despite an interest in doing so. And the convenience of streaming helped me to finally get over this hump. Most of my knowledge of this movie was related to its rather open-ended final scene, which is annoying since it's a bit of a spoiler. But hey, you can't really complain about spoilers years after the movie has come out. Such is the cruelty of life in the internet age. But that still didn't take away from the overall movie experience. Synopsis: Lost in Translation is a romantic comedy drama movie written and directed by Sophia Coppola. The movie won the Academy Award for Best Original Screenplay but had also been nominated for Best Picture, Best Actor, and Best Director. Bob Harris (Bill Murray) is a once-famous actor who travels to Japan to star in a commercial for Suntory whisky. It's not the easiest job given the language barrier and the odd instructions he gets from the director but he's committed to getting it down. Back at his hotel he crosses paths with Charlotte (Scarlett Johansson), a young bride who is repeatedly left alone at the hotel while her celebrity photographer husband John (Giovanni Ribisi) is out on assignment in the city. That leaves her wondering about their future together. The two finally get to talk one night at the hotel bar and find themselves enjoying each other's company. And as Bob finds more reasons to stay in Japan, the end up spending even more time and go out with Charlotte's friends at different places. But eventually they share the problems with their respective relationships and the friendship deepens from there. What I Liked: There's a simplicity to the movie that makes it feel somehow more genuine and honest in its portrayal. It's not a lot of flash or weird camera angles or even long takes. It's just a lot of well mapped-out scenes that give the actors the space and time that they need to deliver great performances. And it turns out to be quite beautiful. And it all feels like Murray and Johansson formed a pretty good bond over the course of the movie - or at least enough of a connection to add some extra depth to the movie. And you just get sucked into things and their respective stories - tales that are not told just in words but also in the silence of their other scenes when they're apart, trying to live their respective lives. What Could Have Been Better: The movie can catch you off guard since it's very subdued in tone and it feels like there's too much you don't know coming into things. The world building is very subtle and takes a rather measured pace through the narrative journey. But not everyone may appreciate this sort of an experience. The ending is infamous for many reasons since it implies that you have enough to know what might have been said but it wasn't done in a manner that was clear. You can't read their lips and efforts to dissect the audio have resulted with very diverse interpretations so in the end we don't know. It feels like almost almost tropey art film style ending but it was a good way to cap this off given the ambiguity of who Bob and Charlotte were to one another. 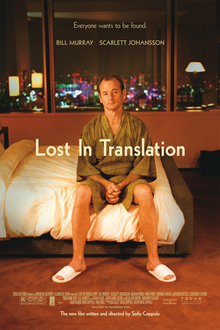 TL;DR: Lost in Translation is an intriguing, complex and ultimately fulfilling story that is a soft romance but many more just a tale of friendship. On the surface it may not seem like the two characters would find common ground but they do and the joy is in seeing them find one another. Thus the movie gets a great 5 heavy moments of silence yet so full of meaning out of a possible 5.